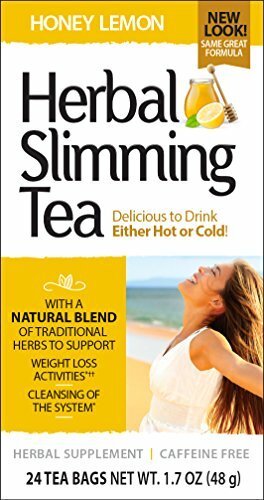 21st Century's Herbal Slimming Tea is a blend of 100% natural herbs which provides a light, delicious caffeine free beverage that helps achieve results in aiding digestion and contributing to weight loss. This all natural herbal tea offers a rich, satisfying taste in hot or iced tea and provides slimming and digestive benefits that may be enjoyed after every meal. 21st Century's Herbal Slimming Tea combines herbs to promote a "thermogenic" reaction which increases metabolic activity. The result is the elimination of storage of excess calories and toxins. Drink anytime - hot or cold and see results! Free diet plan included. Caffeine free. Unconditionally guaranteed for purity, freshness and label potency. No sugar, salt, yeast, preservatives, artificial flavors or colors. LegalDisclaimer This product is not intended to diagnose, treat, cure, or prevent any disease;" or. plural: "These statements have not been evaluated by the Food and Drug Administration. This product is not intended to diagnose, treat, cure, or prevent any disease."